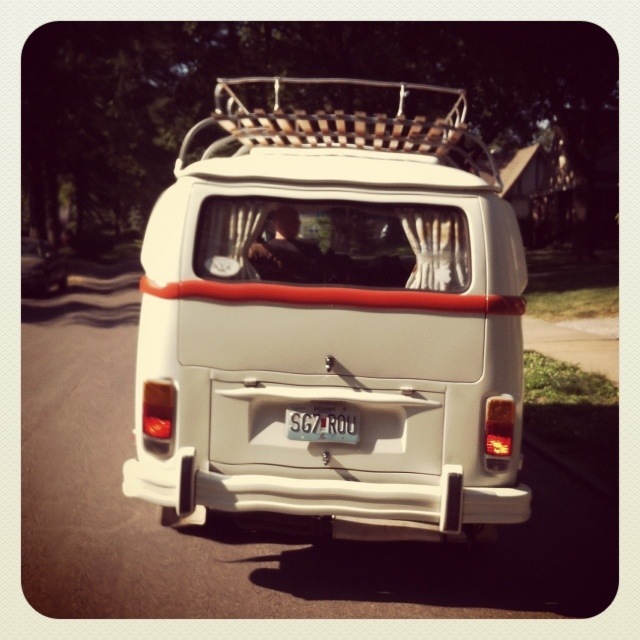 A few years ago, my husband and I flew to Eugene, Oregon and purchased a 1974 VW camper van and drove it back across the US, taking small highways and traveling through small towns until we made it to our home 8 days later in KC. We have lovingly named our bus the Annabelle Lee, because she is like our great ship that takes us every year in search of America. Annabelle is stocked with a couch that folds out to a full size bed, an ice box, a sink, collapsible tables, and a pop top. She is truly the best camping mobile anyone could ask for. She is part of our family. The beauty of Annabelle is that she makes you take life a bit slower and enjoy the scenery more. She takes us back to a simple time, where people traveled on the blue highways and not interstates, finding the unique mom and pop shops and ice cream parlors that defined small American towns. She makes you leave “Generica” and the big box retail stores behind and realize that all you need in life is the ones that you love. When we travel, people look at her and smile. You can’t help it. We feel like we are traveling in a parade with people waiving, truckers honking, and trains whistling. It’s true. Every year we set out for a great American road trip, usually heading north to escape the summer hot box. Two years ago it was Minnesota. Last year, we drove to Wisconsin, the land of beer and cheese curds!!!! This year for our annual trip, we are headed….yes, north and west to Custer State Park. We are in search of great buffalo, blue highways, a good root beer float, slower times, good beer, hiking trails, and each others company. The other thing I love about camping is camping food! No, not hot dogs. I love grilled chicken hobo packets, eggs and bacon in the morning with gritty coffee, and grilled bananas and marshmallows at night. This year I tried something new. I grilled some fresh beets and beet greens that we found at a farmer’s market to go along with the grilled lamb burgers the other night. So good. If you are a beet virgin like me, jump on this! And if you love beets, like my husband, you will want to devour the whole batch. So easy and you don’t waste any part of the beet. Winner winner. and it’s puuuuurty! 2. Pull out a 2 foot sheet of aluminum foil. Fold in half. Open and spray with nonstick spray. Place sliced beets and onions in the middle of the fold. Drizzle with olive oil, salt and pepper. 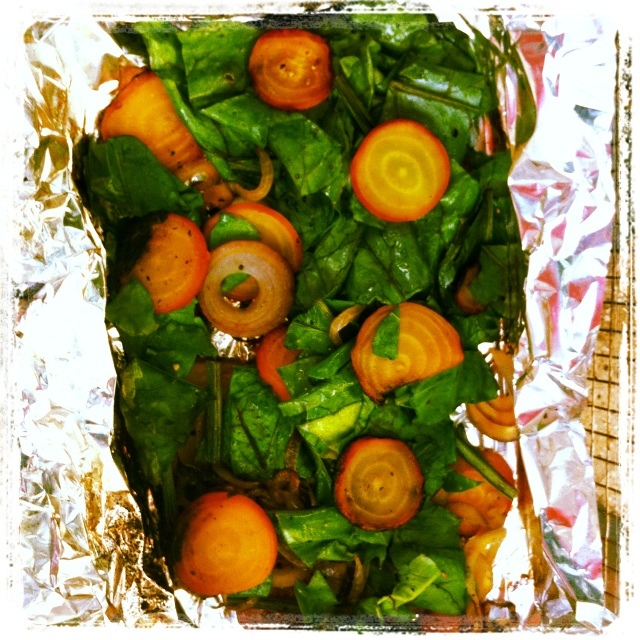 Place beet greens on top. Fold packet in half again, making a pocket. Fold all edges and seal. 3. Place on indirect heat on a grill for 10 to 15 minutes. Opening packet every five minutes and stirring veggies. 4. Remove from grill. Enjoy! So simple, yet I can imagine it will be so good. Love the way you used ALL of the beet plant. We had an old VW at one time too and have lots of wonderful memories. Have a great trip!